Throughout 2019 there are several key dates for compliance with the requisites for e-invoicing, VAT returns and the procurement of products and services in the public sector. For businesses, globalization means having a single market in which to take part as a supplier or as a customer. But there are still particular requirements in each country that need to be focused on if we want to operate efficiently. These are the main new features. April 18 2019 is the definitive deadline for European Union members to adopt, publish and apply the provisions necessary for compliance with Directive 2014/55/EU. As of that date, all European public administrations must be able to accept invoices in electronic format from their suppliers. Italy: From January 1, 2019 in Italy, e-invoicing will be mandatory among private companies (B2B), both for issuance and reception. Also, the Italian government has issued the law that obliges suppliers of the National Sanitary Services (SSN) to manage the receipt of order flows in electronic mode through the NSO platform (Nodo Smistamento Ordini). This means that as of first of October 2019, all public entities in the healthcare sector will only send their orders electronically to any provider. Portugal. 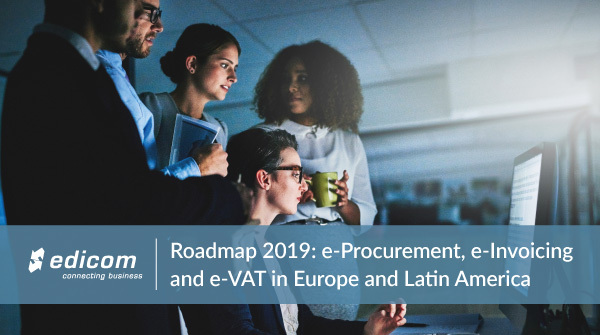 By 18/04/2019, Portuguese public administrations and institutions should have their information systems adapted to the e-Invoicing model. The deadline for e-Invoicing issuance for large companies is April 2020. Poland. The Polish government is working on a central e-invoicing platform (PeF) similar to that up and running in countries such as Spain or France. Invoices will be sent to the public administrations through this platform in PEPPOL format and using PEPPOL Access Points. The platform will also allow the exchange of other business documents such as orders, despatch advices, shipping notifications, receipt of goods confirmations, etc. Germany. Germany is carrying out the pilot tests that will set up their national e-Invoicing platform. This platform called ZRE (Zentrale Rechnungseingangsplattform des Bundes) will act as intermediary between suppliers from public administrations and central public entities. Connection whit this platform will be made via WebServices or via the PEPPOL infrastructure. Sweden. Contracting authorities and their suppliers must adapt to the receipt and issue of electronic invoices as of April 1, 2019. Public Administrations will only accept electronic invoices, preferably using the PEPPOL format. Nevertheless, the national format Svefaktura will also be accepted. Norway. From January 1st, 2019 the new standard of EHF Invoice and Credit Note 3.0 will be mandatory in e-invoicing in B2G. The standard is built upon PEPPOL BIS with the goal to implement EU Directive 2014/55/EU in Norway. Read all the details about e-Invoicing in Europe. EDICOM participates in GOV2EU Project (2016-EU-IA-0096). Supporting public entities to adopt EU Standard on electronic invoice for cross-border transactions. In Spain, the Immediate Information Sharing (SII) system for electronic VAT bookkeeping presents new features in the Canary Isles. On January 1, 2019, the new bookkeeping system for the General Indirect Canary Tax (IGIC) comes into force, based on the Immediate Information Sharing (SII) system, whereby businesses and professionals must send the details of their billing records. The measure will affect approximately 2000 businesses in the Canary Islands. Bear in mind that the main obligation of the SII system consists of declaration to the AEAT of the details of the records of invoices issued and received. (summarized information, not the whole invoice per se), within a 4-day deadline as of the invoice date. Download the SII White Paper with all the details. United Kingdom. Making Tax Digital (MTD). The United Kingdom is working to improve the electronic VAT return system to make it more effective, efficient and easier for taxpayers. From April 1, 2019, companies that exceed the amount of 85,000 pounds in VAT invoiced must, on the one hand, be able to archive their VAT books in digital format and, on the other, send them to HMRC via API electronically, without manual intervention. This report must be transmitted to the HMRC on a quarterly basis. However, companies that wish to do so may send the VAT report periodically, as a way to have more control over their accounts. Colombia. From January 1, 2019, Large taxpayers defined in resolution 0076 of December 1, 2016 must comply with e-invoicing. Throughout 2019, DIAN will communicate implementation dates based on a schedule dividing companies by economic activity. Guatemala. e-Invoicing in Guatemala is gearing up for gradual adoption of the new FEL model from 2019. The Superintendency of Tax Administration (SAT) of Guatemala will define, progressively, the taxpayer segments and the terms for their incorporation into the FEL regime, by issuing administrative provisions, which will be duly notified to them. Panama. Panama continues with the voluntary period of adoption of e-invoicing, pending the legislation. Paraguay. Paraguay is getting ready to start up its e-invoicing rollout project in the country. After the pilot project carried out in 2018 with 14 companies, the SET will now begin the period of controlled voluntary adhesion. Peru. All businesses that are listed today as major taxpayers are required to use an OSE (Electronic Services Operator) as of March 1, 2019. Any company that is listed as a main contributor as of January 1, 2019 will have four months to migrate to the OSE model on a mandatory basis. Uruguay: The e-invoice in Uruguay, known as Electronic Tax Invoice, is adding improvements and new features to its XML schema defined by the DGI. After a period of gradual e-invoicing adoption, Uruguay will require 100% of taxpayers to use this system in 2019. Bolivia: SIN published on Feburary 4th, 2019, a note to inform about the postponement until "more or less August" of the implementation of the Electronic Invoicing System (SFE).The dates were initially scheduled to begin the phased implementation by groups of taxpayers as of March 2019, but now we will have to wait for the new schedule. Access all the details about e-Invoicing in LATAM countries. Contact us. We can help you with any of your international e-projects, with the solution that best suits your needs and in guaranteed compliance with national and local laws.